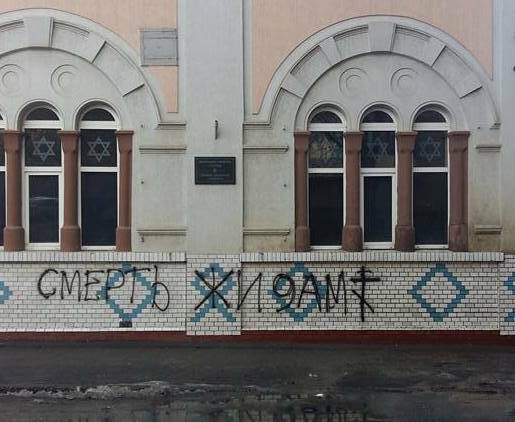 Unidentified individuals wrote “death to the Jews” on the main synagogue of a city in Ukraine that earlier this month saw the rededication of an earlier Jewish house of worship. 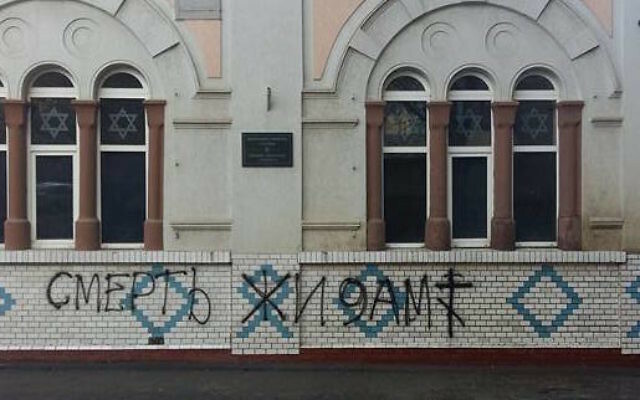 The hateful graffiti was discovered last week on the façade of the Central Synagogue in Chernivtsi, a city located 255 miles southwest of Kiev, a leader of the local Jewish community said. Earlier this month, hundreds of Orthodox Jews convened at the Chernivtsi district of Sadhora of for the rededication of a synagogue that was built in the 19th century by followers of the influential Hasidic rabbi Israel Friedman of Ruzhyn, but had fallen into disrepair decades ago. “It’s a shame to admit that when the country is dealing with war, instead of uniting society some provocateurs are trying to sow ethnic hatred,” wrote Ilya Hoch, leader of the local Jewish charity Miriam, on Facebook with photos of the vandalism. The perpetrators also drew a cross on the synagogue. Also this month work began on the construction near the local Jewish cemetery of a memorial museum for the Jews of the Chernivtsi area, the Vaad group of Ukrainian Jews announced. Separately, on Nov. 19 black paint was poured on a monument for Holocaust victims on Mogilev, a city in Belarus located 150 miles east of the capital Minsk, the Belapan news agency reported. The monument was in memory of at least 6,000 Jews that German troops murdered at the Mogilev Ghetto in 1941. A similar incident occurred in 2012, when brown paint was poured on the same monument, according to Belapan. Police said the 2012 incident was the result of an accident but the local community disputes this, the report said.